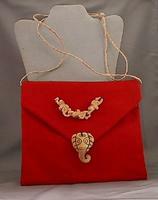 The rich red fabric of the shoulder bag makes the antiqued bone elephants really POP! The shoulder bag measures about 7-1/2" x 8" flat, with the flap closed. The outside of the flap is embellished with a trio of playful pachyderms walking trunk-to-tail, and an elephant face at the flap's apex. Lift the flap, and there's a zipper to keep your belongings securely within the shoulder bag. The zipper is embellished with seed beads that co-ordinate beautifully with the bone elements. The braided raffia strap may be knotted to adjust its length. 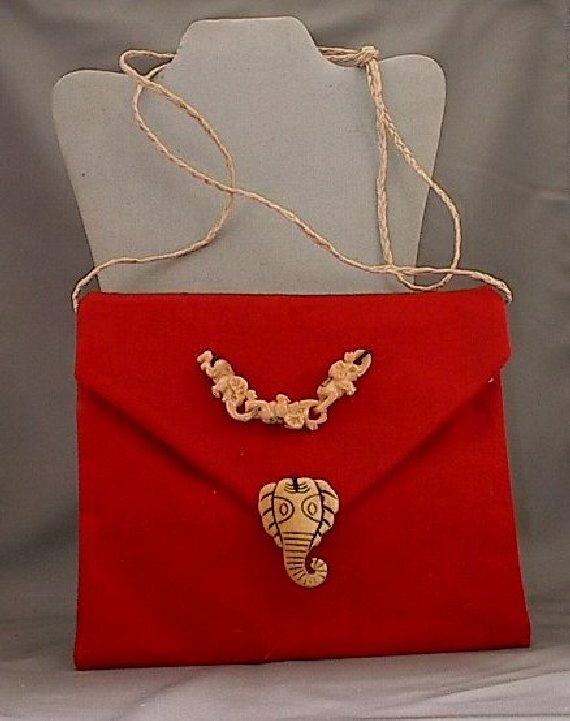 They say that elephants never forget; this is one shoulder bag you'll never forget to take with you. It's another gorgeous, well-made beaded shoulder bag from SPARKLE PLENTY. The deepest, richest red imaginable make these hollow blown glass beads practically vibrate with life.